CONGRATULATIONS TO PATRICK TOOMEY: Patrick won the NFL Punt Pass and Kick Competition for the fourth consecutive year at both the NJ Area and Regional Level this month. The past two years he advanced to Giants Stadium to compete in the NFL Giants Team Championship. At the Team Championship the top 4 Regional winners from NY, NJ and Connecticut compete at Giants Stadium. In the past, Patrick took 1st Place and 3rd Place at the Championship level. His PPK scores were very impressive this year and he is expected to advance to the Championship Competition in November. Patrick has attended the Braves Nation Youth Football Camp the past two years at Manalapan High School. Good luck Pat! Click on logo for full articleOn a night when Edison's offense scored on three of its first five possessions to post 19 first-half points, Manalapan's offense always found an answer. Click on logo for full articleBy catching 23 passes over his last three games, Manalapan senior wide receiver Kevin Cruz is showing he's serious about doing his part to help the Braves achieve their season-ending goals. Click on logo for full articleA pair of touchdown passes to Kevin Cruz from quarterback Michael Bimonte in the second half lifted previously winless Manalapan to a 33-22 victory over Brick Memorial on Friday night in a Shore Conference American Division game. Cruz helped the Braves break into the win column with a 33-22 upset of Brick Memorial as he had 8 catches for 121 yards and two touchdowns as part of a three-touchdown day for junior quarterback Mike Bimonte. Junior running back Josh Firkser also had 136 yards rushing and a pair of touchdowns. During on 0-4 start, Manalapan couldn't seem to put a complete game together. Either the offense was outstanding, like it was in a rolling up over 400 yards in a 48-21 loss to Manalapan, and the defense struggled, or the defense was great, like in a 19-0 loss to Toms River North, and the offense had trouble. It finally all came together in a 33-22 upset of Brick Memorial in the American Division that put Manalapan into the win column. All of the offensive weapons were on full display, with junior quarterback Michael Bimonte throwing for three touchdowns, junior running back Josh Firsker rushing for 136 yards rushing and scoring twice, and senior wideout Kevin Cruz finishing with eight catches for 121 yards and two touchdowns while the defense also had a solid game against the Mustangs' triple option attack. This was what Manalapan had envisioned from the outset, although the Braves had their usual slow start, which usually leads to a strong finish as they have been one of the Shore's best second-half teams in the last five years. While making the state playoffs this season looks like a major stretch as the Braves look to avoid their first losing season since 2001, the future is bright for a team that only has five seniors and returns some primary weapons in Bimonte and Firkser. Firkser has had consecutive 100-yard rushing performances after the running game really struggled early on, and that has helped open things up for Bimonte and the receivers. Coach of the Week: Tom Gallahue, Manalapan. As for Gallahue, his team was staring 0-5 in the face against a favored Brick Memorial team, but the Braves put it all together for an impressive 33-22 victory to break into the win column. Manalapan's 33-22 win over Brick Memorial. The Braves threw a serious monkey wrench into the playoff hopes of the defending Central Jersey Group IV champions. Manalapan scored its touchdown with under three minutes remaining in the game on Mike Bimonte's 2-yard pass to Kevin Cruz. Manalapan done in by big plays. Click on logo for full article. Manalapan trailed 14-7 when Skylar O'Connor made a fumble recovery at the South Brunswick 39. With Josh Firkser doing the majority of the running, the Braves drove to 2-yard line. You can be young and inexperienced, or you can be young and inexperienced with a lot of potential. 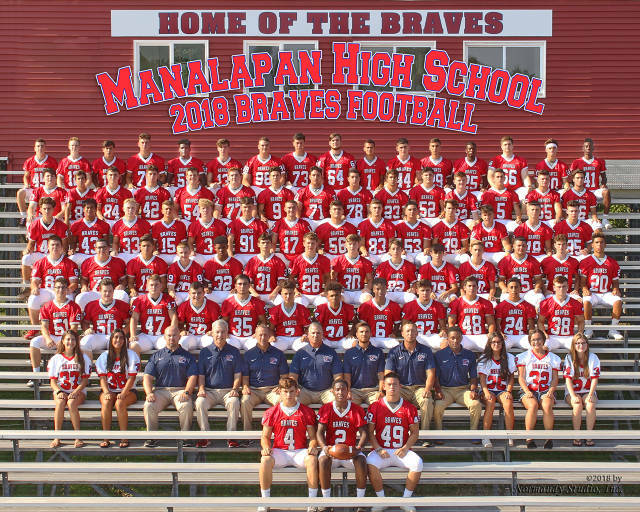 Manalapan High School football coach Tom Gallahue sees his Braves as the latter. With just three senior starters returning from last fall's 5-5 campaign, Manalapan is going to be very young in 2009. However, to Gallahue, that is not necessarily a drawback. "They are very talented young guys and they play with great enthusiasm," he said. Even with the presence of do-it-all 1,000-yard rusher Jimmy Gilburn, the Manalapan football team was going to be in the midst of a transition last season when then-sophomore Mike Bimonte took over at quarterback. When Marion DeBlase was scanning her son's Manalapan football schedule during the preseason, her eyes immediately locked on the date of the season opener. I would like to thank everyone involved in the Chris Gray dedication on Friday night. Ms. Trish Gilburn, Ms. Marion DeBlase, and all the parents of the TD Parents Club provided us with a most memorable event. I would like to also thank the alumni who came back to witness and share in the ceremony; you truly are Braves forever. Thank you to presenter Mark Roberts for a moving presentation in the retirement of Chris' #14 jersey. A very heartfelt thanks goes out to Mr. and Mrs. Gray and the entire Gray family. Your continued grace and courage are models for us all and your support of the young men of this program is greatly appreciated and well-noted. We will never forget. Who is the American Division's sleeper team? Click on logo for full articleWhen Chris Gray was the quarterback of the Manalapan High School football team, the Braves weren't very good. His strong arm was the only show in town then. Yet it didn't prevent him from remaining positive and passing that on to his teammates. He was the team captain his senior year. "He had the spirit," said Mark Roberts, who was an assistant football coach with the Braves during that time in 1985 and 1986. To read more about Chris Gray Click on label to the leftChristopher S. Gray, was killed in the terrorist attack on the World Trade Center in New York. He worked for Cantor Fitzgerald, a brokerage firm that lost 658 of its employees on September 11. CONGRATULATIONS TO THE CAPTAINS OF 2009! Click on logo for full article If Christopher Gray had been here Friday night, he would have been grinning like crazy, his family said. "What's this fuss all about?" his parents said he would be asking. But Gray was not here to see the Manalapan High School Braves, the football team on which he was once a captain, retire his number, 14, during a solemn ceremony. Monmouth County erased Ocean County's two-game winning streak in the US Army All Shore Gridiron Classic with a 30-13 victory at Brick in which it took a 23-0 lead at halftime and never looked back. Manalapan running back Jim Gilburn was Monmouth's offensive MVP with a pair of touchdown runs. Jim Gilburn had an inkling that he would be playing an important role for the Monmouth County all-stars in the 2009 U.S. Army All-Shore Gridiron Classic. In practices leading up to the July 17 game he had impressed the Monmouth County coaching staff, which was being directed by Freehold High School Coach Mark Ciccotelli. "I broke a couple of long runs against the first-team defense," said Gilburn, a 2009 Manalapan High School graduate who rushed for more than 1,000 yards last fall despite playing through nagging injuries. "I felt I had good speed and the explosiveness was there." Ciccotelli and his staff were so impressed with Gilburn that he became a major part of the game plan. He was going to be Monmouth's primary ball carrier in the football game that pits the best graduating seniors from Monmouth County and Ocean County high schools against each other. The game was played at Brick Township High School. Gilburn shredded the Ocean County defense just as he had done in practice against his Monmouth teammates. He rushed for two touchdowns and earned the Most Valuable Offensive Player honors for his team as Monmouth swept past Ocean, 30-13. Gilburn, who will be playing for Stony Brook University in the fall, led all rushers in the game with 63 yards on eight carries. His first score was a three-yard plunge through the line on fourth down. Monmouth's coaches eschewed a field goal to go for it on fourth down. "There was no hesitation to go for it," Gilburn said of the decision. "It was a dive play. I just put my head down and ran into the line." That TD early in the second quarter broke a scoreless tie. Monmouth extended the lead to 14-0 on a 49-yard gallop by Gilburn, who praised his offensive line. "They are the best of the best," he said. "They were unbelievable." Monmouth scored 23 unanswered points in the second quarter and took a 23-0 lead at halftime. For Gilburn, who was finally healthy after an injury-plagued senior year at Manalapan, the All-Shore Gridiron Classic was an opportunity to show what he can really do. "I needed to prove something," he said, adding that being banged up during most of the 2008 season kept him from having an even better year. That, and the fact that he always went to watch the All-Shore games, provided a big motivation. "This game was really special to me," the recent Manalapan grad said. "I played my heart out." Gilburn said he had been preparing for this summer gridiron clash ever since he learned at the end of the 2008 season that he was going to be playing in the game. He found out that his Monmouth County teammates were equally committed. "Overall the team had a lot of great athletes and they were all ready for the game," he said. "We came into sync very quickly." Heading the Monmouth County offense were quarterback Nick Tyson and receiver Brandon Brown, two of the players who helped lead Freehold High School to the 2008 NJSIAA Central Jersey Group III state championship. The presence of Tyson and Brown, Gilburn said, was the reason the Monmouth all-stars were "very confident." Tyson, who made a complete recovery from a broken vertebra in his neck that he sustained in 2007, gave the Monmouth County squad the same leadership qualities he gave the Colonials last fall. "Nick is a hard-nosed kid," said Gilburn. "The way he came back is inspiring. He never felt sorry for himself, he just kept coming back. He was a great captain." Tyson and Brown hooked up one last time to complete the Monmouth scoring on a 36-yard pass play in the fourth quarter. For the game, Brown caught six passes for 70 yards to lead all receivers, and Tyson led all passers, throwing for 122 yards while hitting on 7-12 passes. Freehold Township High School graduate Ryan Spadola caught two passes for 20 yards. There was one player on the Monmouth County squad that Gilburn was looking forward to playing alongside, and that was Freehold Township's Matt Faiella, a linebacker — first, because they were high school rivals, and second, because they will be teammates at Stony Brook. Faiella and Colts Neck High School's Sean Smith spearheaded a Monmouth defense that held Ocean County scoreless until the fourth quarter. Ocean gained only 70 yards rushing for the game. Monmouth County's victory snapped a three-year losing streak to Ocean County and that was important, Gilburn said. "The rivalry is huge," he said. ALL SHORE GAME WAS "HOME OF THE BRAVES"
It was a memorable night for those connected with the Manalapan program, starting with running back Jim Gilburn, who earned offensive MVP honors for Monmouth County with a pair of touchdown runs in its 30-13 victory. That was a great moment for Braves head coach Tom Gallahue, who watched Gilburn gut out a 1,000-yard season at less than 100 percent in the fall on a young team featuring a sophomore quarterback. Headed to Stony Brook, Gilburn capped his career in style on Friday night. That wasn't the only proud moment for Gallahue, as his daughter, Brittany, a junior at Monsignor Donovan, joined good friend Melissa Lampiasi in singing "God Bless America'' to the packed crowd at Brick before the start of the fourth quarter. It also was a good night for Capt. Rob Hanratty, a 2002 Manalapan graduate who played in the Gridiron Classic as a senior and now is a marketing and recruiting operations officer with the US Army. Hanratty played a large role in bringing the sponsorship of the US Army to the game, which featured a crowd of over 3,000. Hanratty's father actually works with Gilburn's father as a police officer with the Port Authority of New York and New Jersey, and Hanratty could remember delivering papers to Gilburn's house years ago. Manalapan's James Gilburn looked right at home on Friday night playing alongside players from sister school Freehold. Gilburn, was selected as Monmouth County's Most Valuable Offensive Player. Click on logo for articleThe Manalapan High School football team will have new Nike cleats for the 2009 season. That will be the Braves' prize after being selected as the overall winner in an essay contest promoted by Donald Brown. I also caught a glimpse of Manalapan as it faced off against defending South Jersey Group IV champion Mainland on Friday in the pouring rain and the Braves looked solid against a program that is perennially in the playoffs no matter who graduates. Junior quarterback Mike Bimonte has added about 25 pounds and refined his throwing motion, and the next beast of a running back to replace Jimmy Gilburn appears to be junior Josh Firkser, who saw time last year. Just like Gilburn, he has moved from tight end to tailback and has good size and speed. Speedy senior Kevin Cruz looks like he also should be able to make some plays down the field at wideout. The Braves also have a very strong sophomore class that should help make this team a real force over the next three years, including one running back/linebacker whose name I don’t want to butcher until I get the official spelling. I didn’t get to see much of the defense, so I can’t give a great read on that, but defensive end Johnny Dokouslis looked good and there appeared to be some good speed at linebacker. Congratulations to the following Braves each took first place at this years lift-off. ALSO PARTICIPATING IN THE LIFT OFF FOR THE BRAVES.